Hello. My students are writing about Dr. King and his legacy and I just wanted to make sure the theme this year is "I've Decided to Stick with Love". Is that correct? I can't seem to find a flyer for 2017. 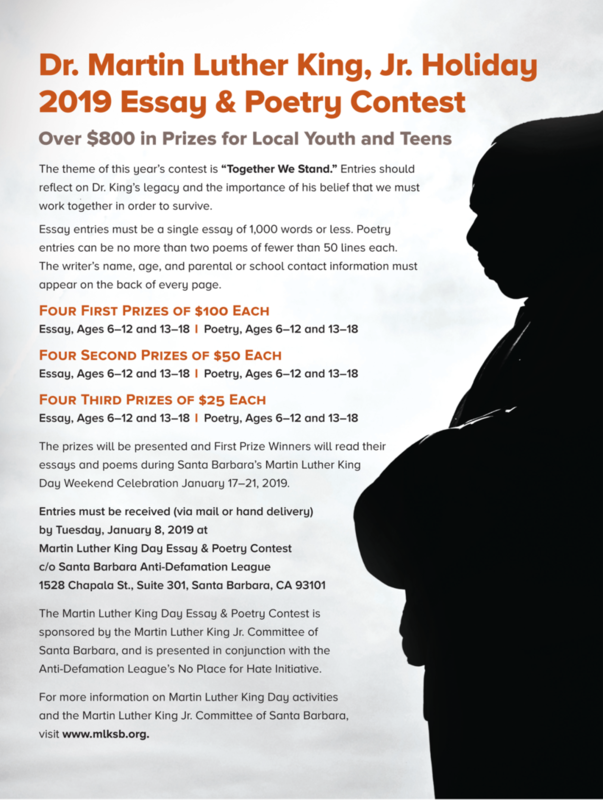 The date for submitting entries for MLKSB Essay and Poetry Contest has been extended to Jan 8, 2018 due to School closures, caused by the Thomas Fire. Sorry for any inconvenience. Also, entries may be submitted to ADL, See info on flyer. Thank you for your comments. Please tell me what you mean by WV. Also, I hope you had a chance to participate in some of the programs offered by the Dr. Martin Luther King Committee this year. What programs or event did you attend? What did you like, or didn't like about it.